I’m pretty stoked on summer coming to a close. It means that my beloved beach city will return to the residents, there will be less marine layer in the morning, and the weather will still be warm! We moved to San Clemente last year about this time, and it was absolutely BEAUTIFUL. The Fall season also brings a lot of great produce delights with it. I’m specifically looking forward to persimmons. But until they arrive, I will have to make do with all the delicious heirlooms tomatoes that abound. Here’s an idea for breakfast time! Well, you could actually eat these at anytime of the day. I’m always hearing people in the paleo world complaining asking about what are some good breakfast meals rather than the typical egg-bacon fare. Here is the answer for you peoples. In a bowl mix together all of the ingredients until well combined. In a skillet, heat 2-3 Tbsp. of oil/fat until hot. Flatten slaw mixture into pancakes about the size of your palm. Lay them in the oil and cook on one side until crispy. Flip and cook the other side until crispy. 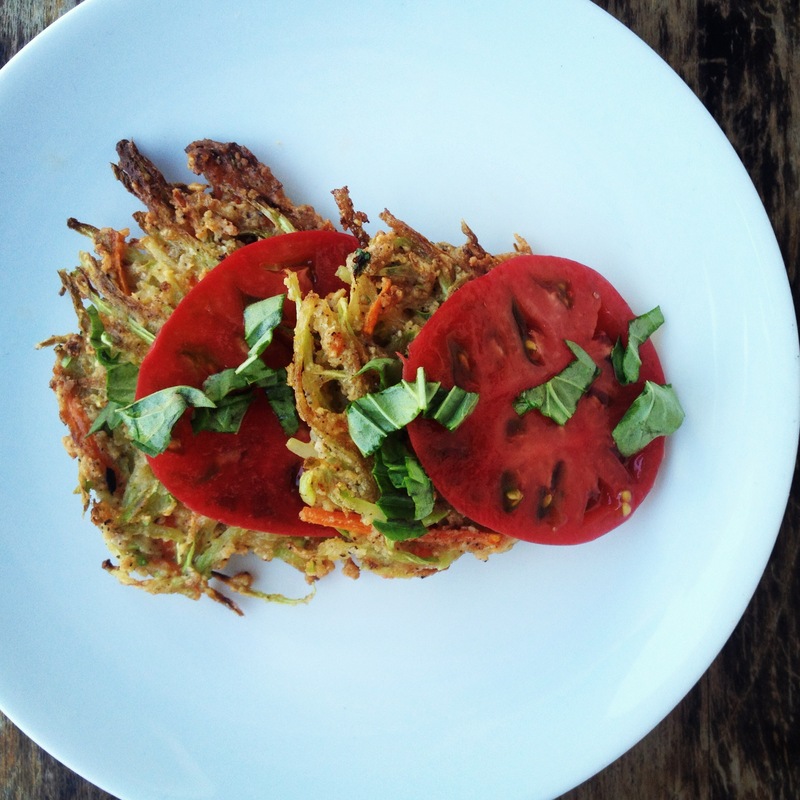 Serve with fried eggs, heirloom tomatoes and basil, bacon or sausage…. the possibilities are endless!